Basic Steps Preschool Learning Program has two primary goals: (1) help the children gain the necessary skills to be successful in kindergarten and (2) provide a safe learning environment where children can grow to be independent and confident in themselves. At Basic Steps, we seek to educate the whole person and expose children to as much information/facts as possible so that they are better connected to the world around them. Our extra-curricular classes are fun and will help children develop interests toward different subjects and activities. For example, we have Spanish, karate, and piano classes for parents to choose from. Below you will see our current schedule. Please click on the schedule to expand the view. For preschoolers who are advanced (knows all the letter sounds and counts 1-30), they can join our AP (Advanced PreK) classes or TK (Transitional Kindergarten) Program. For more info about these advanced classes, please contact us. Basic Steps Preschool Program started in Fall 2012 with only 2 classes once a week at Kent Commons. In January 2013, we found a space and started offering 4 sessions a day from 8:30am to 12:15pm, Monday thru Friday. After 1 year of opening (in Fall 2013), we opened our afternoon classes. Our advanced classes (AP program) and the tutoring session started after 2 years of opening when many of our preschoolers are advancing at an very ideal rate. In Fall 2018, we finally had the opportunity to take over the space next to us and open the Coop Program and the elementary-school program (Kindergarten, 1st and 2nd Grade). Our classes focus on delivering different types of skills such as social and emotional development, motor development, language and literacy development. The preschool curriculum is designed to help children build a strong foundation to be successful in school—which involves discussions of different kinds of topics, singing, art work, math activities, reading and writing practice. Every week we focus on different types of art and science projects. To find out more about the different topics for each month, check out our calendar here. You can also visit our Facebook page and check out our photos of different art projects. During the academic year from September to June, parents can register a maximum of 4 classes. Our program is very flexible. Parents can register as few as one 45-min session per week or as many as 20 sessions per week. The tuition is prorated accordingly depending on the number of classes registered per week and how many weeks left in the quarter. Holidays and planned vacations will not be charged. Please notify the director by the deadline. 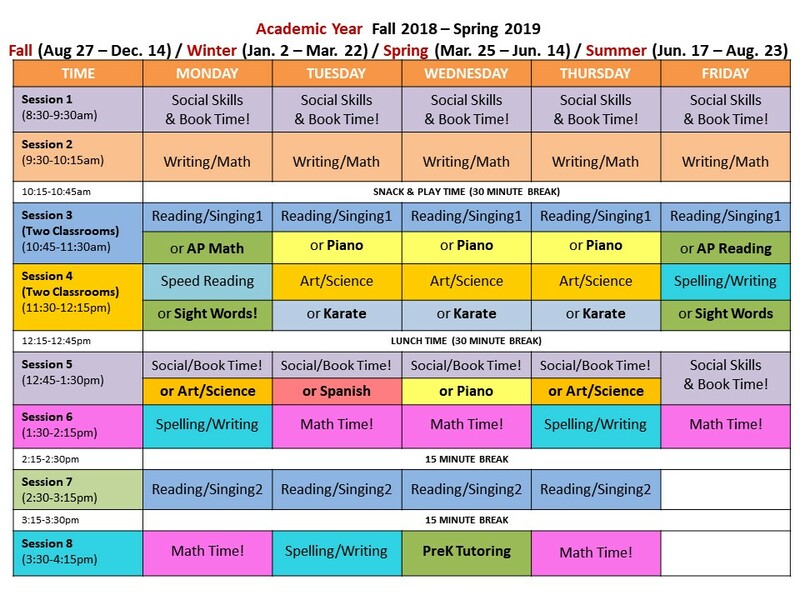 In the summer, we have a different schedule and parents have the option to register for more than 4 sessions. Our summer program focuses heavily on advancing PreK children’s literacy skills. These classes will be scheduled for 10 weeks only. For more information about our intensive reading and spelling classes, click here.